Public Health officials said Tuesday, Jan. 8, that they're concerned about flu trends in Georgia this year. It's not clear whether the flu season could be as or even more severe as last year's, state epidemiologist Cherie Drenzek told the board of the Georgia Department of Public Health. "It's too early to know," she said, adding, "Some trends to date seem concerning." H3N2 was the main virus circulating nationally during the last flu season, which led to 154 reported deaths in Georgia and was considered the nation's worst flu outbreak in at least 40 years. As of the end of December, Georgia had four flu deaths statewide and 440 hospitalizations related to the flu in the eight-county metro Atlanta area. Those numbers are up from one death and 193 flu-related hospitalizations at the same point a year ago. Children under age 5, people who are 65 or older, and those with compromised immune systems or chronic medical conditions are most at risk for flu complications and are strongly encouraged to get a flu vaccination as soon as possible, if they have not already done so. It's too early to say how effective the flu vaccine is this time, Drenzek said. Last season's vaccine was a poor match to the virus that was circulating, which limited its effectiveness in the overall population. But experts note that even a limited vaccine can prevent many cases, make some people's flu less severe and reduce the extent of an outbreak. Drenzek and other health officials emphasize that it's not too late to get a flu shot and encourage everyone who has not had one this season to do so. Dr. Andi Shane, medical director of hospital epidemiology at Children's Healthcare of Atlanta, said that "while we have seen a decrease in the number of flu cases at Children's after the holidays, we anticipate a spike of influenza B infections in late January or early February. Now is the time to get vaccinated, if you haven't already, to provide the best protection against influenza for yourself and others." The Georgia Hospital Association said that it's working closely with hospitals to monitor flu activity. Although Georgia has been classified as a high-risk state by the CDC, at this time last year the number of patients requiring flu treatment was higher, GHA said. Georgia Health News tracks state medical issues on its website georgiahealthnews.com. Graysville Elementary School now has state-of-the art facilities with their new two-story campus, thanks to ESPLOST funding. On Thursday, Jan. 10, Graysville Elementary School celebrated the grand opening of its new building with a Catoosa Chamber of Commerce ribbon-cutting and student-led tours of the new facility. From left: School board member Suzan Gibson, Superintendent Denia Reese, school board member Jack Sims, school board chairman Don Dycus, school board member David Moeller, Graysville Elementary Principal Kerri Sholl and Assistant Principal Shelley Johnson. 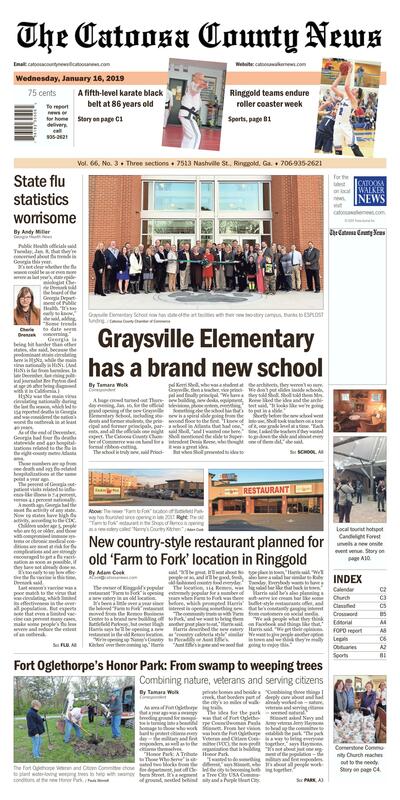 A huge crowd turned out Thursday evening, Jan. 10, for the official grand opening of the new Graysville Elementary School, including students and former students, the principal and former principals, parents, and all the officials one might expect. The Catoosa County Chamber of Commerce was on hand for a formal ribbon-cutting. The school is truly new, said Principal Kerri Sholl, who was a student at Graysville, then a teacher, vice principal and finally principal. "We have a new building, new desks, equipment, televisions, phone system, everything." Something else the school has that's new is a spiral slide going from the second floor to the first. "I knew of a school in Atlanta that had one," said Sholl, "and I wanted one here." Sholl mentioned the slide to Superintendent Denia Reese, who thought it was a great idea. But when Sholl presented to idea to the architects, they weren't so sure. We don't put slides inside schools, they told Sholl. Sholl told them Mrs. Reese liked the idea and the architect said, "It looks like we're going to put in a slide." Shortly before the new school went into use, Sholl took teachers on a tour of it, one grade level at a time. "Each time, I asked the teachers if they wanted to go down the slide and almost every one of them did," she said. The slide, said Sholl, is not used for regular transportation from the top to the bottom of the school. "We use is as a reward for good behavior." There's an elevator, too, for the more dignified. The cost of the entire project, which is actually still in progress, is $13.5 million, paid for with ESPLOST V funds. The new building consists of 48,782 square feet, which includes 21 classrooms, a media center and, said Sholl, a new and much safer area for buses to drop children off and pick them up. Part of the old building will be demolished and removed, but part of it, which ties in with the new school, is being renovated and will include the gymnasium, cafeteria, music room and classrooms for kindergarten and first grade. All buildings will have new metal roofs. The final phase of the project will be the installation of a new playground. "I feel so privileged," said Sholl, "to work in a system with a superintendent and board that want the best, safest schools for students. Everyone has been wonderful about all this — the architects, DH&W, the contractors, EMJ Corporation, and parents who were so patient and understanding about having to park across the street and walk over to the school while construction was going on." "This beautiful new building is here today because our community continues to support ESPLOST," said Catoosa Schools Superintendent Denia Reese, "to provide world-class learning facilities for our children. Benjamin Franklin said, 'An investment in knowledge yields the best dividends.' The Board of Education and I cannot thank the public enough for investing in the future by providing great schools for our students to learn in today. With everyone's support, we are developing students who will be good citizens and leaders of the future." The Fort Oglethorpe Veteran and Citizen Committee chose to plant water-loving weeping trees to help with swampy conditions at the new Honor Park. Honor Park, says committee chairperson Jerry Haymons, is about paying tribute to everyone — citizens and those who work in military and first responder roles to keep them safe. An area of Fort Oglethorpe that a year ago was a swampy breeding ground for mosquitos is turning into a beautiful homage to those who work hard to protect citizens every day — the military and first responders, as well as to the citizens themselves. "Honor Park: A Tribute to Those Who Serve" is situated two blocks from the fire department, just off Cleburn Street. It's a segment of ground, nestled behind private homes and beside a creek, that borders part of the city's 10 miles of walking trails. The idea for the park was that of Fort Oglethorpe Councilwoman Paula Stinnett. From her vision was born the Fort Oglethorpe Veteran and Citizen Committee (VCC), the non-profit organization that is building Honor Park. "I wanted to do something different," says Stinnett, who led the city to becoming both a Tree City USA Community and a Purple Heart City. "Combining three things I deeply care about and had already worked on — nature, veterans and serving citizens — seemed natural." Stinnett asked Navy and Army veteran Jerry Haymons to head up the committee to establish the park. "The park is a way to bring everyone together," says Haymons. "It's not about just one segment of the population — the military and first responders. It's about all people working together." The first problem VCC faced was a water issue. "When we started, there was 10 inches of standing water in some parts of the park," says Haymons. "The EPA would not let us divert it." VCC called upon Fort Oglethorpe City Arborist Megan Mullinax. "Megan helped us find trees that would absorb water," says Haymons. "We're planting weeping trees that use up to 150 gallons of water a day." Weeping trees, including willows, make up the personality of the park. The largest, which will eventually grow to 80 feet, represents the largest portion of the population — citizens. Throughout the park, other weeping trees — four varieties, so far, including a weeping cherry tree, represent the minority of the population that protects the majority. There is a tree each for the branches of the military: Army, Navy, Air Force, Marines, Coast Guard and Merchant Marines. There will soon be trees to represent police officers, firefighters and emergency medical services. There is even a tree to represent service animals. A huge oak tree that was already standing on the property has been dubbed "The General." Mullinax helped the committee choose trees that will bloom at different times and in different colors to add to the interest and beauty of the park. But that's just the beginning of the thought that has gone into what will be planted. "The edges of the park that border homes," says Haymons, "will be lined with over 30 crepe myrtles. Some will bloom white and some red, and we learned that putting iron shavings around the bottom will turn some of the white ones blue. So we'll have red, white and blue." "The local Gold Star Wives will choose the flowers that will go in the garden," says Haymons. And that's still not all. Stinnett says there will be a Purple Heart tree and a tree to honor WACs — Women's Army Corps members, thousands of whom were trained in Fort Oglethorpe in the 1940s. Rolling Thunder TN II will be planting MIA, POW and KIA trees. In addition to all this, the military trees ring an area that will feature a "missing man" chair. There is a 30-foot flag pole in the park and parking for up to ten vehicles. VCC is also planning for lighting and they hope to one day have a pavilion in the park that already has public restrooms on the grounds. "We planned on this taking three years," says Haymons. "Right now, we're a year ahead of schedule." Stinnett says many people have contributed to the building of Honor Park. "Tennessee American Water Company has done amazing work helping us clear and prepare the land," she says. Funding, supplies, discounts or other help have been provided by Modern Woodmen of America, Gold Star Wives, IBEW Local Union 175, Food City, Camping World, Flags Unlimited, Sequatchie Concrete, Ray Adkins, the Fort Oglethorpe Fire Department, First Volunteer Bank and Natalie Hunt with Community National Bank, and as well as many individuals. The city of Fort Oglethorpe has committed to some funding for the park, too. To help raise funds and personalize the park for those who visit, VCC is selling granite pavers that can be engraved with service symbols and names. The pavers will be placed throughout the park or, if people wish, they can keep their pavers. The cost is $150 for a 12-inch by 12-inch engraved paver. "We're working with Avery Monuments in Flintstone," says Haymons. "We wanted to keep it local so if we ever have a problem it can be handled quickly." Haymons says the committee decided against offering engraved bricks when they learned that bricks begin to crumble within 5-7 years. The all-volunteer Veteran and Citizen Committee consists of ambassador Paula Stinnett (a non-voting member), chairperson Jerry Haymons, vice chair Mack McCord, treasurer Frank Donato, secretary Mae Duncan and chaplain Charity Gibson. The committee meets at Fort Oglethorpe City Hall at 6 p.m. the first Thursday of each month unless otherwise announced. The public is invited to attend and get involved. To learn more, see VCC on Facebook at facebook.com/FortOglethorpeVeteranandCitizensCommittee or email them at ftovcc@gmail.com. And swing by and see the park for yourself.